WNBA- New Orleans was founded in June 2011. 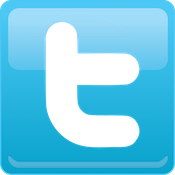 Our members are booklovers, booksellers, editors, librarians, publishers, scholars and writers. WNBA-New Orleans meets monthly at various locations in the New Orleans area. We discuss varied literary topics of interest with a lot of great speakers and networking! National Reading Group Month: We celebrate local book groups and authors at this annual Fall event. Little Free Libraries: We promote the placement of more of these outdoor micro-libraries that encourage reading and promote literacy and community engagement. The Pinckley Prizes for Crime Fiction were established by WNBA-NOLA in 2012 for women writers to honor the memory of Diana Pinckley (1952-2012), a longtime crime fiction columnist for The New Orleans Times-Picayune, and her passion for mysteries. Pinckley was a founding member of the WNBA-NOLA, as well as a civic activist, who gave her time and energy to local and national causes. For more information, visit www.pinckleyprizes.org. Board Members: Constance Adler, Marie Breaux, Sheila Cork, Susan Larson, Judith Lafitte (at-large), Dawn Ruth Wilson (at-large), Pam Ebel (at-large), and Alex Reisner (at-large). 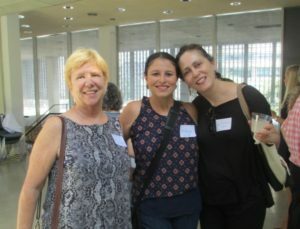 Nina Calvo of Tulane’s Latin American Library hosted a chapter meeting. 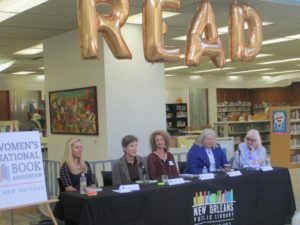 The Women’s National Book Association of New Orleans grew out of a chance conversation after the Tennessee Williams/New Orleans Literary Festival in March 2011. Mary Grey James, then the national president, had appeared on a panel at the Fest, and afterward, Susan Larson, host of WWNO-FM’s The Reading Life, asked her old friend what was giving her the most satisfaction in retirement. 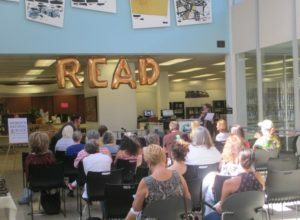 In June, 2011, a group of more than 20 women – librarians, booklovers, writers, publishers — met at the historic Latter Library on St. Charles Ave. to discuss forming a chapter. 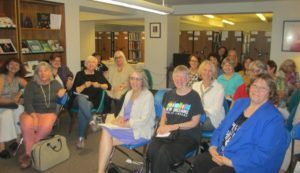 Mary Grey came down for a meeting in July, and the chapter was on its way. The first officers were Susan Larson, president; Amy Loewy of Garden District Book Shop, vice president; writer Christine Wiltz, secretary; and Peg Kohlepp of the Tulane University Bookstore, treasurer. Over the course of the first four years, Judith Lafitte of Octavia Books became vice president, Abi Pollokoff of Pelican Publishing became secretary; and writer/designer Karen Kersting became treasurer. The Chapter’s mission has evolved over time. We support local writers and booksellers and literacy efforts. Most of all, we support one another. Little Free Libraries have been a priority from the very beginning, and LFL ambassador Linda Prout, who is the leading advocate for the libraries in our area, is a board member. Linda was the first person in our area to have a Little Free Library, and she has guided the movement in New Orleans, which now has approximately 80 of the little book-boxes in all areas of the city. 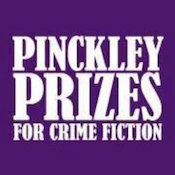 After the death of WNBA-NOLA founding member Diana Pinckley, we established the Pinckley Prizes for Crime Fiction. There are two annual prizes of $2,500 each. One recognizes a distinguished body of work; the other, a fine debut novel. The first honorees, in 2014, were Laura Lippman and Gwen Florio for her debut novel Montana. The second honorees were Nevada Barr and Adrianne Harun for A Man Came Out Of a Door in the Mountain. In 2016, WNBA-NOLA recognized Sara Paretsky for her distinguished body of work and Christine Carbo for her debut novel, The Wild Inside. 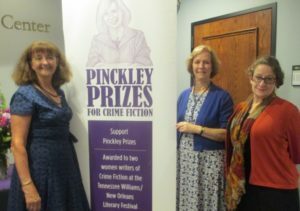 The judges for the Pinckley Prizes are Constance Adler, Mary McCay, and Christine Wiltz; Susan Larson is the administrator. A fund-raising event that has become identified with our chapter is the Art-of-the-Book contest and auction, which invites artists to submit their interpretations of book arts using recycled materials – everything from jewelry, to woven vests, to extraordinary altered books. The chapter has also adopted the Metropolitan Women and Children’s Center and conducts an annual book drive in December to donate much-needed reading material to the Center. In 2015, WNBA-NOLA hosted the national board meeting, which included the presentation of the Bookwoman Award to VIDA founder and poet Amy King. Programs over the last years have been many and varied. Among the more popular have been visits to libraries and archives. Charles Brown, executive director of the New Orleans Public Library, has kept us up to date on local progress in the challenging post-Katrina years. Susan Tucker, curator of books and records for the Newcomb Archives and Vorhoff Library at Tulane University gave a presentation on how to maintain personal archives and papers; Nina Calvo of the Latin American Library at Tulane University presented fascinating items in that book collection; Liz Williams of the Southern Food and Beverage Museum showed us the treasures of that culinary library. Member and now WNBA president Sheila Cork introduced us to artists’ books in the New Orleans Museum of Art Collection. Other meetings have focused on writing. Member Steve Beisner provided an informative introduction to new software available for writers; Dianne de las Casas presented a program on social media for book marketing; Candice Huber of Tubby and Coo’s Book Shop offered a power point primer on the use of social media in establishing an on-line presence. Attorney Marie Breaux gave a fascinating lecture on the evolution of copyright law. 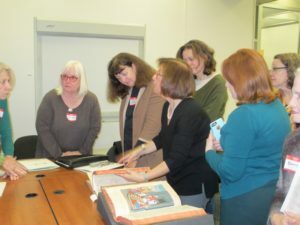 We have also had some programs about bookselling, including a look at the role of college booksellers and college bookstores with Peg Kohlepp of Tulane University. Elizabeth Barry Ahlquist of Blue Cypress Books and Maggie McKeown of McKeown’s Books and Difficult Music (now closed, sadly) presented an amazing evening of tales from the antiquarian trade, right down to unusual items they’ve found inside books. 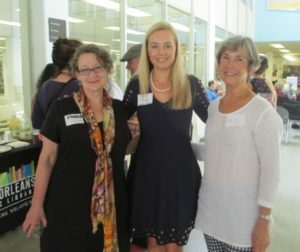 Our National Reading Group Month events have included a Sunday morning coffee at Newcomb College Institute, as well as a panel of mystery writers; two Book Club Conferences at the New Orleans Museum of Art and the New Orleans Public Library; and Readings Round the Bayou in conjunction with local independent bookstores. In 2016 Sheila Cork, New Orleans Museum of Art librarian, serves as president; intellectual property lawyer Marie Breaux is vice president. Literary activist Sara Woodard chairs membership; writer Teresa Tumminello Brader is secretary, and Karen Kersting is treasurer (for life!). Our membership has grown to 70+ in our fifth year. Included in that number are published authors, librarians, publishers, booklovers, editors—and even a couple of men! We do everything with a New Orleans flair. We don’t hold meetings in August in case of hurricanes. Wine flows generously at our meetings. We serve extraordinary food at our parties, and have hosted some legendary potlucks to celebrate chapter anniversaries. Best of all, our chapter grew out of one enduring friendship between two women. 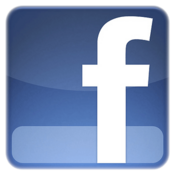 And now – there are countless friendships among the 70+ of us! Author panelists (l. to r.) Kristy Woodson Harvey, Laura Mullen, Lara Naughton, Jean M. Redmann and moderator Susan Larson. 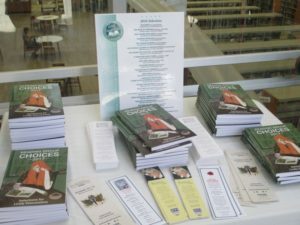 Octavia Books provided books to be autographed and sold to attendees. Book group representatives shared their experiences. 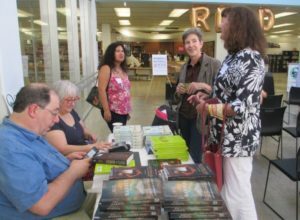 Octavia Books co-owners Tom Lowenburg and Judith Lafitte handled book sales.